World premiere on April 26, 2014 by conductor Michael Tilson Thomas and New World Symphony. California premiere (dates TBD) for 2015 by conductor Michael Tilson Thomas and the San Francisco Symphony. Composing Carnival Fever was an enjoyable and inspiring experience. I wrote the piece very quickly, and hopefully my enthusiasm can be sensed in the music. Moments whip past at a brisk pace, filled with a whimsical, joyful spirit. At the same time, a serious intensity lies beneath the celebratory mood. While composing Carnival Fever, several literary associations came to mind. The most influential one was “The Carnival at Rome,” a chapter from The Count of Monte Cristo by Alexandre Dumas. Young Albert (the unknowing target of Monte Cristo’s machinations) and his friend Franz experience a carnival, which commences only moments after a grisly public execution in the same piazza. Although the Count, who had invited the young men to witness the scene, had responded during the execution by “burst[ing] into a laugh; a terrible laugh, that showed he must have suffered horribly to be able thus to laugh,” he remains unmoved throughout the festivities. In contrast, Albert and Franz are “seiz[ed]” by the “general vertigo” and are “like men who, to drive away a violent sorrow, have recourse to wine, and who, as they drink and become intoxicated, feel a thick veil drawn between the past and the present.” Throughout the carnival, a mysterious woman flirts with Albert and at the end, lures him toward danger. Instead of the spectacle of gloomy and silent death, the Piazza del Popolo presented a spectacle of gay and noisy mirth and revelry. A crowd of masks flowed in from all sides, emerging from the doors, descending from the windows. From every street and every corner drove carriages filled with clowns, harlequins, dominoes, mummers, pantomimists, Transteverins, knights, and peasants, screaming, fighting, gesticulating, throwing eggs filled with flour, confetti, nosegays, attacking, with their sarcasms and their missiles, friends and foes, companions and strangers, indiscriminately, and no one took offense, or did anything but laugh. Imagine the large and splendid Corso, bordered from one end to the other with lofty palaces, with their balconies hung with carpets, and their windows with flags. At these balconies are three hundred thousand spectators—Romans, Italians, strangers from all parts of the world, the united aristocracy of birth, wealth, and genius. Lovely women, yielding to the influence of the scene, bend over their balconies, or lean from their windows, and shower down confetti, which are returned by bouquets; the air seems darkened with the falling confetti and flying flowers. In the streets the lively crowd is dressed in the most fantastic costumes—gigantic cabbages walk gravely about, buffaloes’ heads bellow from men’s shoulders, dogs walk on their hind legs. As the day advanced, the tumult became greater. There was not on the pavement, in the carriages, at the windows, a single tongue that was silent, a single arm that did not move. It was a human storm, made up of a thunder of cries, and a hail of sweetmeats, flowers, eggs, oranges, and nosegays. The night was rapidly approaching; and already, at the cry of “Moccoletti!” repeated by the shrill voices of a thousand vendors, two or three stars [candles] began to burn among the crowd. It was a signal. At the end of ten minutes fifty thousand lights glittered, descending from the Palazzo di Venezia to the Piazza del Popolo, and mounting from the Piazzo del Popolo to the Palazzo di Venezia. It seemed like the fête of jack-o’-lanterns. It is impossible to form any idea of it without having seen it. Suppose that all the stars had descended from the sky and mingled in a wild dance on the face of the earth; the whole accompanied by cries that were never heard in any other part of the world. Italian premiere of third movement (chamber orchestra version) on November 20, 2011 by conductor Silvia Massarelli and the Orchestra Teatro Olimpico in Vicenza, Italy. World premiere on March 11, 2005 by conductor Paul Zukovsky and the Bavarian Radio Symphony Orchestra in Munich, Germany. I remember reading a poem about a person who, while dreaming, unlocked certain life truths, only to forget them upon waking. This moment in which one is suspended in wonderment, in the face of mysterious yet daunting absence, when one is armed only with the power of questioning and the knowledge of no longer knowing – this is the moment that opens the piece. It is from this sense of loss that all else springs: the restless uncertainty of the first movement; the meditative stillness of the second; and the muted madness of the third. In terms of motion and mood, the three movements can be seen as 1.) active melancholic, 2.) passive melancholic, and 3.) active dramatic. One can perceive the portraits of Three Portraits as belonging to the same individual, yet taken from different moments of that person’s life. The perspectives of others on that individual as well as the self-perspective of the individual at times clash or are inseparably combined. Within the larger structure of loss, I envisioned a smaller structure of dichotomy. It encompasses opposing forces, such as lightness and darkness, movement and stillness, presence and absence, complexity and simplicity. Yet within this ambiguous yet transparent mass, I gave each phrase its own individuality and personality so that it contrasts with other musical personalities within the same body. Three Portraits is painted in dark and subtle colors; the orchestration more transparent than full; the proportions clearly defined; the interplay of lines both savage and delicate. World premiere in May 2003 by conductor Jeff Milarsky and the Juilliard Orchestra. A prelude to the second movement, Fates is comprised of two sections. The first section introduces the main motives of the piece in the form of intertwining melodies, while the second provides depth and color to those melodies. Despite the expressive freedom of the piece, the harmonies in the strings maintain a latent tension. After a brief clarinet solo, Fates movesattacca into the second movement. Furies is a perpetual motion movement from the beginning to the end. A barely-controlled ferocity characterizes the majority of the movement. Indeed, it is the oppressed nature of the Furies’ rage that makes it so dangerous and deadly as it boils beneath the surface. Furies has six sections – the first featuring the main motives of the piece in accented and long notes; the second being a brief fugato; the third consisting of a long buildup and climax; the fourth comprised of asymmetrical fragments; the fifth being a recapitulation; and the sixth serving as a coda. Fates & Furiesis dedicated to Dr. Samuel Adler, whose support as advisor, teacher, and friend has been priceless. Commissioned by Orpheus Chamber Orchestra as part of Project 440.
with additional major support provided by Thomas Bishop. World premiere on October 13, 2011 (opening night) by Orpheus Chamber Orchestra at Stern Auditorium, Carnegie Hall. Other performances at the William Center for the Arts in Easton, PA, Stern Auditorium and the Jorgensen Center for Performing Arts at the University of Connecticut, CT. In honor of their memories which shall always inspire us. To commemorate their strength and endurance during difficult times. In January 2011, shortly after I sketched the first two minutes of Memoriam,my father was advised to look into hospice care. My father had been fighting cancer for several years, and it became increasingly clear that the piece I was composing for Orpheus would be dedicated to his memory. Memoriam,however, is not only a personal work, it is also one that is intended to speak more broadly to humanity. At the center of the difficult, yet universal, experience of losing a loved one lies the potential to open one’s heart in new, courageous ways and to reach deeper levels of inter-connectedness with one another. The music, therefore, undergoes a gradual transformation from darkness to light, moving in waves similar to the ebb and flow of latent emotions. At the beginning, such melodies take the form of descending lines amidst oscillating and tenebrous textures. In the middle, elements of humor and playfulness emerge with twittering winds above lively strings. The end mirrors the beginning, as the opening’s descending lines are now inverted as climbing, yearning gestures. Intending to capture the feelings inspired by Rilke’s poetry in my music, I composed Memoriamto express not only sorrow, but also to provide comfort, hope, and warmth. Memoriamis, most of all, a work of compassion – a quality which so many have expressed toward my family in various, wonderful ways. I hope to share this compassion and extend it to others, who have similarly been left behind, in the form of this musical work. 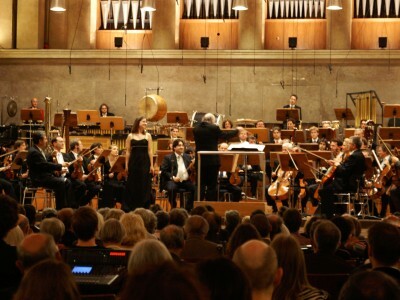 World premiere on May 11, 2007 by soprano Anna Palimina, conductor Johannes Kalitzke, and the Bavarian Radio Symphony Orchestra in Munich, Germany. Adapted from the following poetry: Henry Wadsworth Longfellow, “A Psalm of Life”. Po Chü-I, “On His Baldness,” “Since I Lay Ill”, “The Chrysanthemums in the Eastern Garden,” and Li Po, “Waking from Drunkenness on a Spring Day,” translated by Arthur Waley, from More Translations from the Chinese. Used by permission of the Estate of Arthur Waley. All rights reserved worldwide. They’re all gone, and I don’t mind at all! My tiresome comb’s forever laid aside. To have no top-knot weighing down one’s head! On my bald pate I trickle a ladle-full. Since I lay ill, how long has passed? Almost a hundred heavy-hanging days. How rapidly my mood changed from sad to gay. To watch from a pillow the beautiful Spring blossom? Why do you bloom alone? Taught by you, I will open my face. Lying helplessly on the porch. A lonely bird was singing ‘mid the flowers. Had the day been wet or fine? And as there was wine I filled my own cup. Wildly singing I waited for the moon to rise. “Life is an empty, endless dream! The soul is dead that slumbers. World premiere in June 2000 by pianist Cynthia Lee Wong, conductor Benjamin Zander, New England Conservatory Youth Philharmonic Orchestra.